Infinity....Eternity...Continuity...Concepts that attempt to define the undefinable. ANANTHAAL is the brand new all star musical collaboration brain childed by award winning composer,and music producer Clinton Cerejo. Featuring two incredible singers,Vijay prakash and Bianca Gomes who have unique vocal styles and sonic identities, ANANTHAAL seamlessly juxtaposes strong Indian motifs with Western harmonic concepts and neatly packaged strong musical hooks that never leave your head. 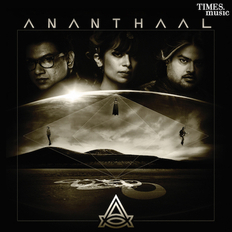 Blurring the lines between genres, ANANTHAAL truly defines the new song based fusion that is at once engaging and intriguing. The band’s self titled debut album is the result of extensive studio sessions with ace musicians Gino Banks, Sheldon D’silva, Beven Fonseca and Pozy Dhar forming the core rhythm section and also has featured soloists like jazz maestro, Louis Banks and the prodigious guitar virtuoso, Dhruv Ghanekar.The country’s premier lyricists like Amitabh Bhattacharya, Shellee and Manoj Yadav along with some fresh new writers like Siddhanth Kaushal have all worked on the project. The incomparable pool of talent that comes together on this album give the music spontaneity that is fresh and exciting with a truly universal appeal. Well known for his awesome vocal performance on the Oscar winning song “JaiHo”, Vijayprakash is one of the most sought after playback singers with hits in Bollywood and a series of award winning hit songs in the South Indian film Industry. Whether it’s scoring films, judging music reality shows, appearing on Coke Studio, singing over 3000 jingles, or performing with the likes of Zakir Hussain, A.R.Rahman, and Taufiq Qureshi at venues like Wembley, the O2 Arena, WOMAD or Woodstock, Vijayprakash shows absolutely no signs of slowing down. His cutting edge vocal prowess and wealth of musical knowledge and experience is only manifest to the fullest in the brand new ANANTHAAL material. A current favorite in the thriving advertising and jingle scenario in Mumbai, Bianca has numerous jingles to her credit. She toured North America and Europe with Bollywood mavericks Vishal Shekhar on the Bacchans much talked about “Unforgettable” tour. Influenced by alternative, jazz and R&B, Bianca seamlessly blends these genres with indi pop and creates a sound altogether her own. With film credits that include Amit Trivedi’s “English Vinglish”, ‘Ekk Main Aur Ek Tu”, Telegu composer Gibran’s‘Jil’, and two highly lauded seasons of Coke Studio, her rendition of songs like the classic “Mauje Naina” continue to garner praise in music circles in India and beyond. Her unique understanding and approach to Indian melodies from a western perspective pushes the boundaries of pop fusion and gives ANANTHAAL’s music a truly global reach. A multiple award winning composer and producer working in the Advertising and Film Music industry in Mumbai for over sixteen years, Clinton’s body of work includes commercials for Google, Audi, Pepsi, Vodafone and numerous films as a producer with Vishal Bhardwaj, A.R. Rahman, Vishal-Shekhar, Shankar–Ehsaan–Loy and Salim Sulaiman to name a few. Clinton was the first contemporary composer from India to conduct a master class and a residency at the prestigious Berklee College of Music in Boston. Best known for his work on Coke Studio, his song ‘Madaari’ went on to be come the single most pivotal song in the indie music scene over the last five years. With ANANTHAAL’s music, Clinton pushes the envelope of Indian music in to completely uncharted waters and is his most adventurous work yet.